Mallory Headsets P3 Bluetooth headset. Perfect for truckers and every day drivers alike. Everything about the VXi BlueParrott B450-XT says more. It’s got the most effective (96%) noise-canceling microphone. A considerably longer (up to 300-foot) wireless range (when paired with other Class 1 devices). A bigger, cushier ear cushion, and a more-comfortable, more-durable padded headband. 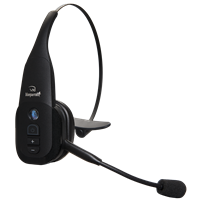 The B450-XT also has more advanced Parrott Button features, like VoiceControl, for hands-free control of headset functions, and voice memo record. All together, they make the VXi BlueParrott B450-XT more useful, more convenient—and more indispensable to the mobile professional.